St Peter was one of the very first churches I visited when I made it my business to visit every church in Suffolk in the mid-1990s. That first time, I didn't even have a camera, but I came back this way in 1999 with a point-and-click film camera, and set about recording the inside. The church was open, as they pretty much all were around here apart from Euston and Elveden. Since those early days I've revisited just about every Suffolk church at least once, but it was not until the summer of 2016 that I came back to Fakenham Magna. 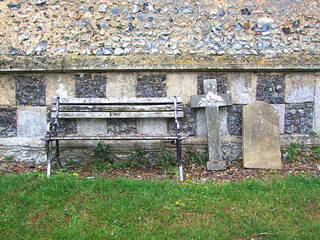 In general, I've been really uplifted by revisiting Suffolk churches. Many of those which were locked twenty years ago are now open or accessible, and in general churches are in a far better state of repair. 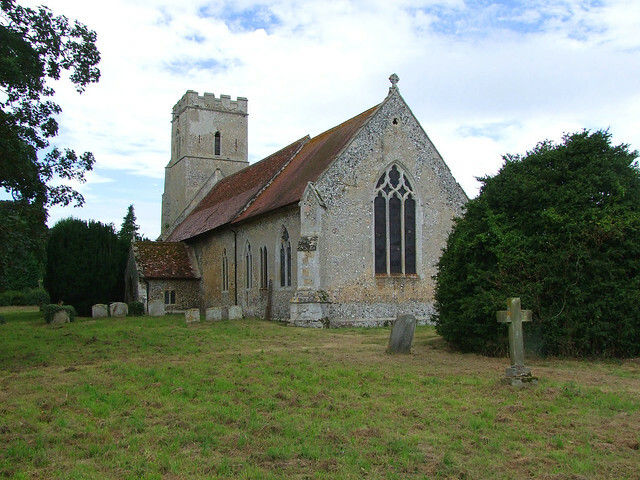 Suffolk's rural parish churches feel more loved than they did in the 1980s and 1990s. But I am afraid that there are exceptions, and occasionally I've revisited a church only to find that it has fallen on hard times. This is the case at Fakenham Magna. The church seems neglected, probably disused, and it is locked without a keyholder notice. It seemed sad that a place once full of life was now entering its death throes. Here's what I wrote in 1999: 'St Peter is one of those little Victorianised churches which, at first sight, seem to have little to offer the enthusiast. But, as so often, it would be a mistake to pass by. Firstly, although it was a rigorous restoration, it was in the mid-century, like that at Rede, making it more sympathetic to local needs and vernacular style than those later in the century. And it did not hide the Anglo-Saxon long-and-short work where the tower joins the nave. 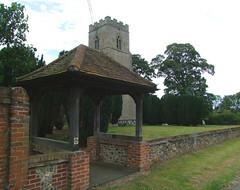 Small evidence perhaps, but it shows that this is one of the oldest churches surviving in Suffolk. 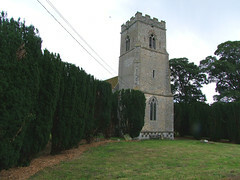 The tower above is 14th century. It also left untouched the Norman lancet windows to north and south. As you approach the door, note the 14th century ring handle, which is very fine. Inside, Fakenham church looks as if it is all 19th century, except the table tomb in the chancel, although even that appears to have been reconstructed and recut. But inside, too, there is more than meets the eye. The Victorian screen is constructed upon its medieval predecessor, and it is done very well. The piscina is also medieval, although the Victorians recut it, and built the sedilia beside it. The font is also recut medieval. There is a scattering of medieval glass in the south windows of the chancel, including some very characterful heads. Everything is well done, and taken care of. A rather gruesome story attaches to the graveyard. In 1966, when pipe-laying work was taking place, a large mass grave was discovered. It was dated to the mid-14th century, and was therefore almost certainly a result of the Black Death. In 2016, I am forced to wonder if Fakenham Magna church will one day go the same way.